WBSHFWS Notification is out. WBSHFWS is recruiting for 26 District Epidemiologists Govt Job Posts. You can check WBSHFWS - West Bengal State Health and Family Welfare Samiti last date, download WBSHFWS notification, visit WBSHFWS official website and check other WBSHFWS Vacancy details.Complete Vacancy and recruitment Details about 26 District Epidemiologists Govt Job vacancies in WBSHFWS are provided below by JobSarkari.Com only for you. Last Date of Registration. 07/02/2019. Last Date of Submit Complete Form. 15/02/2019. Mode of Payment. Candidate Can Pay Application Fee Through Online And Offline Mode. District Epidemiologists Candidate Must Have Passed MBBS with PG Degree/Diploma in Public Health / Epidemiology (MD (PSM/ Community Medicine), DPH, MAE, MPH). Candidate Should Have Passed MBBS with Minimum 02 Years Experience in Public Health. Candidate Must Have Passed M.Sc in Life Science/ Epidemiology with Minimum 02 Years Experience in Public Health. Candidate Should Have Passed BAMS/BHMA with MPH. Not Exceeding 40 Years. 26. 1. On Basis of Marks Obtained. 4. After Registration System Will Generate a Login ID and Password. 6. Candidate Need to Apply Online on or before 07th February 2019. Q. What is the Last Date For WBSHFWS District Epidemiologists Govt Job Vacancy ? A. Last Date for WBSHFWS District Epidemiologists Govt Job Posts is 15/02/2019. Q. What is the Form Type of WBSHFWS District Epidemiologists Govt Job Recruitment ? A. The Form Type for WBSHFWS District Epidemiologists Govt Job Posts is Online. Q. 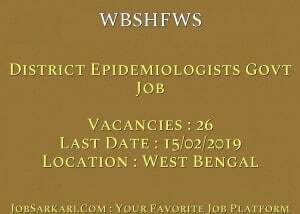 How many vacancies are available in West Bengal State Health and Family Welfare Samiti District Epidemiologists Govt Job Posts ? A. 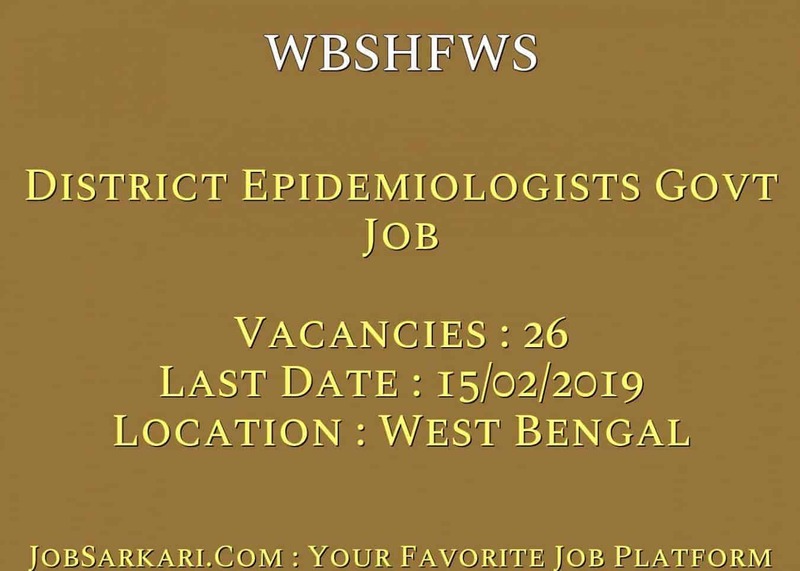 There are about 26 Vacancies in West Bengal State Health and Family Welfare Samiti District Epidemiologists Govt Job Posts.